← Green Room Interview: Declan Sinnott talks about his album ‘I Love The Noise It Makes’. I Mandala – a promising Indian theatre group from the Indian immigrant community in Ireland is proud to present ‘Nagamandala’- an Indian English play written by internationally acclaimed artiste Girish Karnad and directed by Kumaradas T N – a young theatre director from National School of Drama, Delhi on 21st June 2014 @ Civic Theatre, Tallaght, Dublin at 8.00 pm. 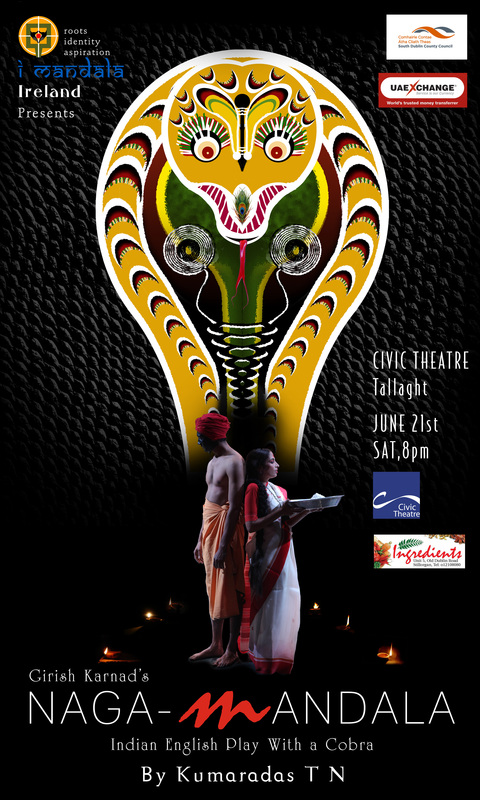 The play revolves around the mysterious relationship between a King Cobra and a young woman trapped in societal taboos; that challenge her marital fidelity and adherence to accepted religious practices. The play promises the audience an abundance of visual and sound spectacle that truly reflects Indian subjectivity, tradition, folk, culture, artistry, mythology, and story telling. Nagamandala plays at Civic Theatre on Saturday, 21st June 2014 @ 8pm. This entry was posted in Events and tagged Civic Theatre, India, Indian Theatre, Ireland, Nagamandala, Tallaght, Theatre. Bookmark the permalink.